Scotland's progressive metal band Concept Of Time appears from the highlands with a triumphant and polished, though short, debut A New State Of Thought. The musicianship displays both expertise and enthusiasm; the song composition wiser than most bands who've been around much longer; and the production is crisp and lucid without being mechanically sterile. These are qualities oft found in bands far more mature and likely on a distinguished label. Echoes of prog metal greats like Symphony X and Dream Theater are clearly evident, yet brushes of Threshold and Evergrey, without the excessive darkness or harshness, can be found in this tapestry. Excepting the last song, A New State Of Thought has a seamless quality from the opening instrumental Open Your Eyes through Eternal Sleep, purely intended I believe. With Concept Of Time blends varied musical styles into their compositions including the usual suspects of power and symphonic metal. A songs like Nothing More Than A Memory and Eternal Sleep deliver moments of intensity balanced with delightful passages of atmospheric and mysterious instrumentals. Embrace The Life is possibly the most diverse piece here as it begins with hasty power metal only to submerge into knotty arrangement of varied tempos and near cacophonous peaks. Most notable throughout is Tom Perret's raw, unrefined, yet passionate vocals; his delivery could put some listeners off at times. In the end, however, it's all good, and makes A New State Of Thought a formidable entrance into the prog metal field. 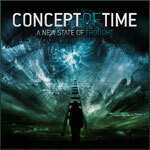 Concept Of Time's A New State Of Thought is impressive, well-crafted debut of progressive metal from this young band which rivals their peers in intelligence and creativity. It's only flaw is that it is too brief.